Za (part of Shiseido) launches the True White Range , it gives me a immense pleasure to review this product since I am big fan of all Shiseido's products. I had also tanned from my last vacation, as a result, going out during the day makes me want to protect my skin more. 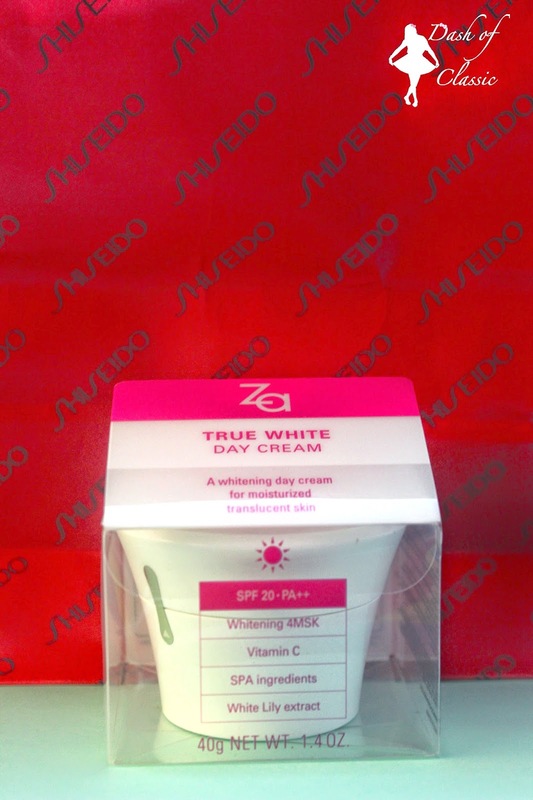 Fortunately my doorbell ring and I got the delivery of Za True White Day Cream , ever since then I have been using this product and and it works like a charm, read up for more details on this cream below. Medium day cream to give moisture and clarity to the skin. Leaves skin feeling smooth, shields it from ultraviolet rays and daily environmental damage. ⇒Penetrates and blends into the skin quickly leaving a refreshing feeling without making your skin feel sticky. Comfortable to use before makeup. As the final step of skincare, squeeze a moderate amount (about 0.6g) on your finger-tip, apply several dots on the face and spread gently from the center of the face towards the outside of the face.